“I have about £500 to spend, which valve amplifier should I buy?” It’s one of the guitar world’s most frequently asked questions and the answer has long been simple: the Fender Blues Junior. Portable, decent sounding and giggable (with a sensible drummer), it’s easy to see how it became a huge seller. Yet recently, new title contenders have emerged, sensing the opportunity to knock the Blues Junior off its perch, and NAMM 2019 saw Supro throw its hat into the ring with the Blues King – an affordable 15-watt combo with mid-century stylings and tones that turned heads on the show floor. 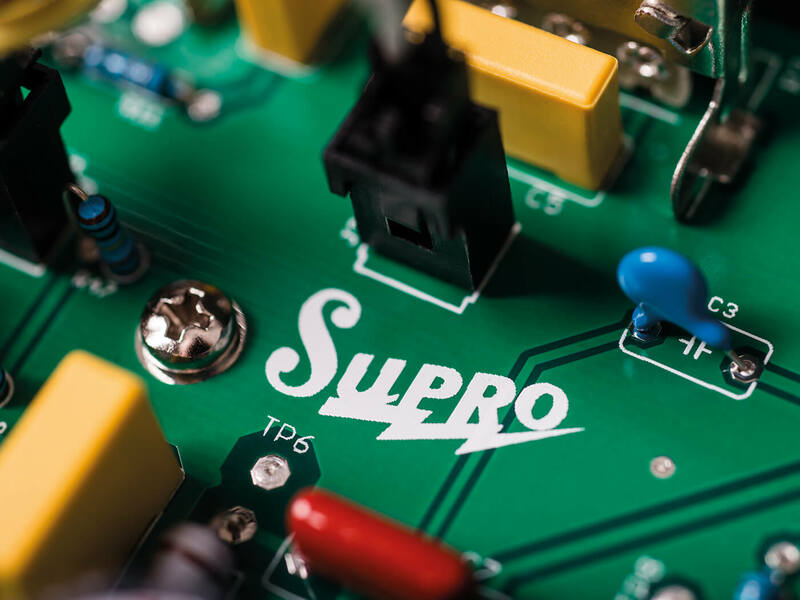 Since its 2014 relaunch under the ownership of Long Island’s Absara Audio – also parent company to stompbox firm Pigtronix – Supro’s renaissance has been heady. With rock royalty such as Lenny Kravitz and Joe Perry onboard, the company’s guitar, amp and effects designs reference the past without being shackled to it. This is evidenced by a recent collaboration with stompbox guru Robert Keeley on the pedal-friendly 1970RK amplifier. The 1812R Blues King is another case in point. The speaker cutout resembles Supro’s 1950s Valco-made Spectator and Comet (whose cabinet designs have been echoed in recent times by the likes of Swart), while the simple white piping, textured vinyl and art-deco logo plate have the understated elegance of a modern boutique unit. 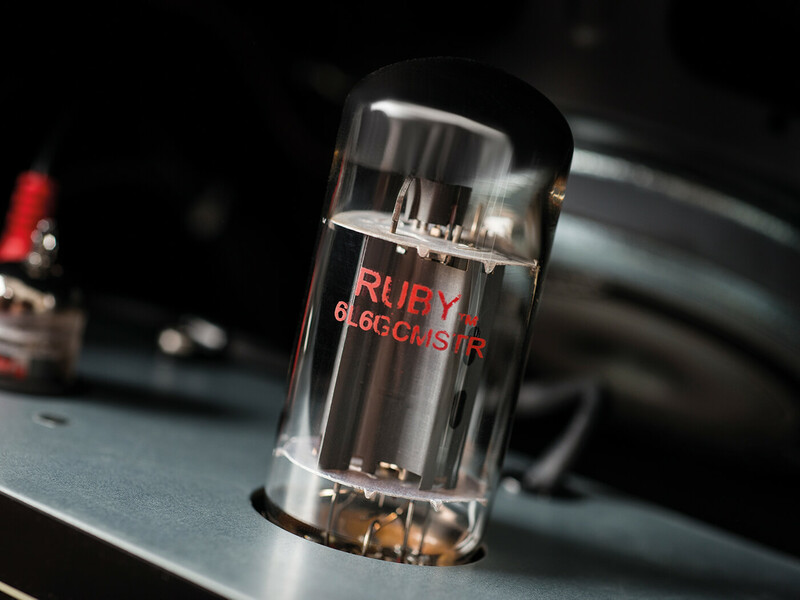 Internally, in order to keep things wallet-friendly, valve bases and components reside on neat modern PCBs, while the 12AX7 preamp and single-ended 6L6 power amp are augmented by a switchable FET-driven boost and cascading FET-driven high-gain mode. 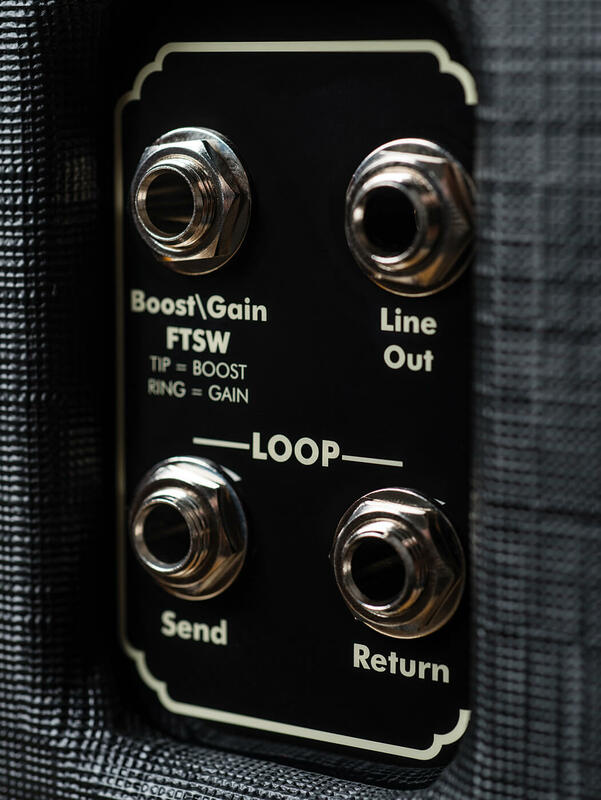 Those boost and high-gain switches can be triggered remotely via an optional two-button footswitch (£59.99). A master volume, three-band equalisation and an onboard 235mm reverb tank add versatility, and the scope is expanded further by a rear-panel effects loop. 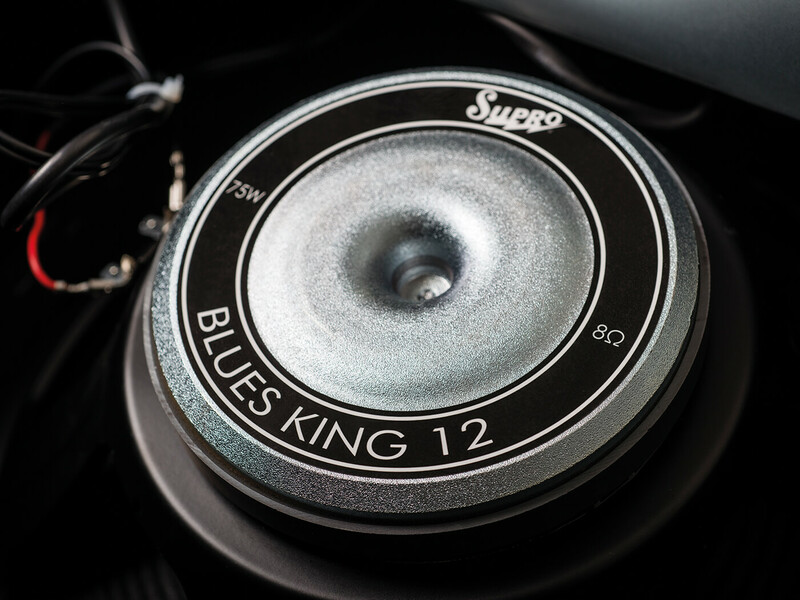 Although the solitary speaker output powers the combo’s internal Supro-branded 12-inch driver, there’s also a rear-panel line out, providing a buffered preamp output should you require it. The cabinet has been smartly assembled and about the only downside to this grab-and-go design is that, in order to swap out power or preamp tubes safely, you’ll have to remove the steel chassis – the valves are orientated horizontally in the void between the chassis and the rear of the cabinet’s front panel. Not exactly a quick change if a tube fails at a gig, but on the plus side, when the amplifier is in bits at your feet, its chunky power and output transformers are confidence-inspiring. Like many vintage and vintage-style amps, when viewed from the front, the control panel lettering is upside down. Some people find upside-down text hard to read, while for others it doesn’t require a second thought. However, the Blues King isn’t exactly a Hughes & Kettner TriAmp, so it shouldn’t take long to become accustomed to the locations of the controls. Plugging in and exploring the Blues King’s array of sounds with a decent Stratocaster, our first impression is how full-bodied the tones are. With the boost and gain switches disengaged, the key is to push the volume and master controls as hard as the room allows. With the reverb around two o’clock, the EQ set flat and the master and volume at one o’clock, it’s a delicious platform for neck-pickup noodling with plenty of that dark sparkle that characterises some of our favourite American amplifiers of the 1950s. 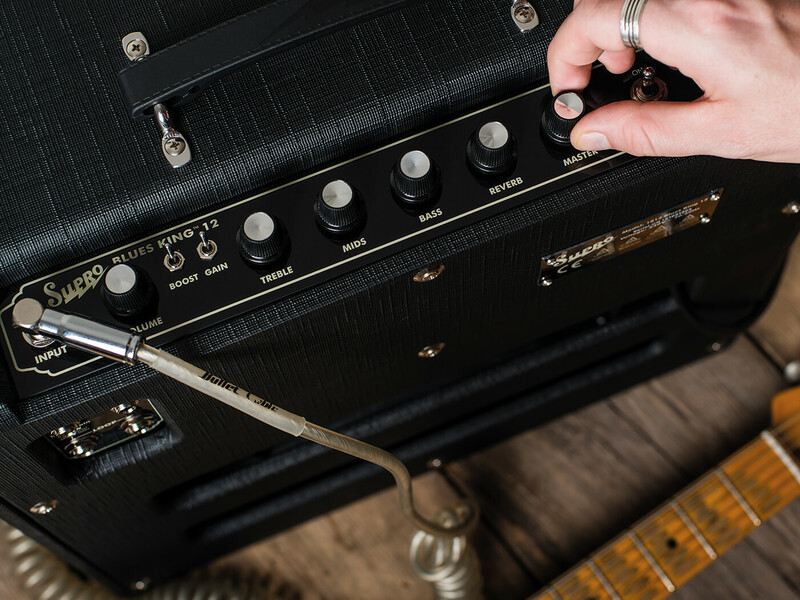 If you want to scoop things out and get more of a Blackface sound, then pushing the treble and rolling back the mids will do the trick, although the sensibly voiced tone controls don’t take the amplifier’s smooth and seductive character away when pushed to extremes. So far, so impressive. Background noise levels are low, bass response is punchy and the partially open-back cabinet design means you don’t need to be standing in the beam of the amp to hear it properly – there’s a satisfying room or stage-filling spread. In case you think we’ve been seduced by the sumptuously voiced onboard spring reverb, fear not – even in dry mode there’s plenty of harmonic interest and the good stuff is still there. The presence of the aforementioned effects send and return means that you can add your own preferred ambience to taste either in front of the amp or in the loop. All that said, life is generally better with spring reverb in it, so we roll the knob back up to around halfway and begin to investigate the boost and gain switches. 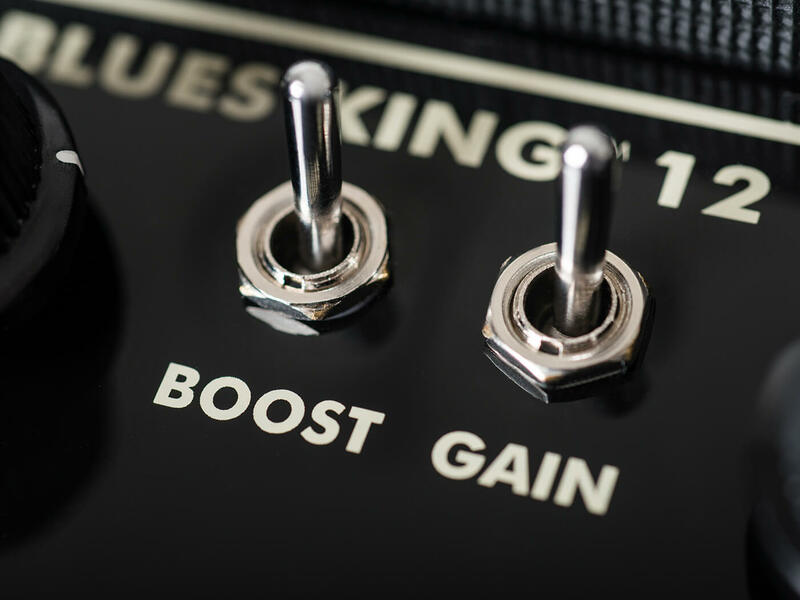 Engaging the boost adds a significant chunk of extra volume and smooths things out a little, but rather than simply providing a useful level hike for soloing in a two-guitar band, it also allows you to get a little more out of the amp at neighbour-friendly volumes. Try backing off the master and switching on the boost for an experience that’s a little more satisfying under the fingers. With the volume cranked and the boost engaged, proceedings are starting to get a little raunchy, especially when switching from our Strat to an Esquire equipped with a Broadcaster-style bridge pickup. We’re firmly in Keef territory now; it’s impossible not to tune to open G and enjoy a tweedy mixture of of grit and sparkle that stays clean when you’re gentle and growls when you’re mean. The master volume works very well indeed here, too, and you can get those enjoyably dynamic tones even when your ‘audience’ consists of several potted plants and the family cat. 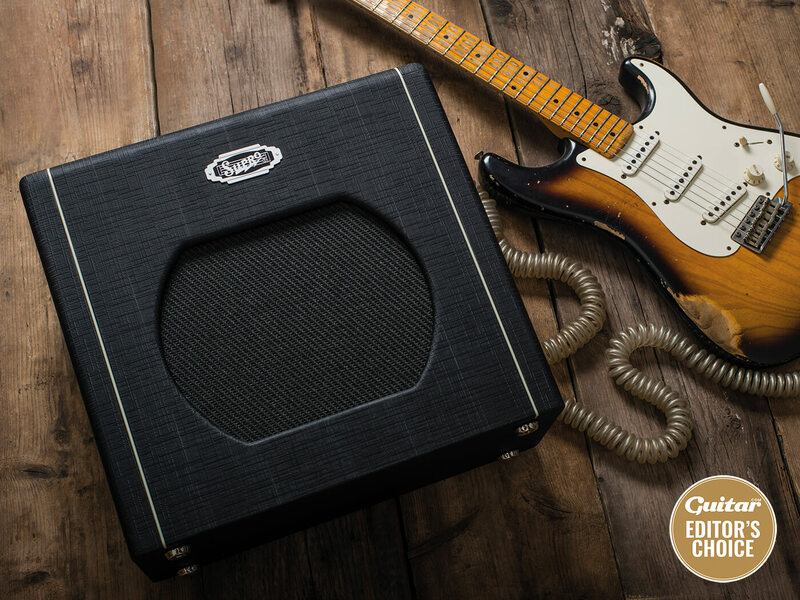 Many of us would be more than happy with an amp that simply covers the ground we’ve described thus far, but the Blues King has additional levels of dirt to unleash. With the boost disengaged and the gain switch activated, Richards exits stage left as Gibbons and Page take over. It’s here you’ll find those dense, sizzling overdrive tones that most guitarists hear in their head when they think ‘Supro’. Other than adding a tremolo circuit, it’s hard to imagine how the Supro design team could have crammed more into such a compact cabinet. At both stage- and home-friendly volume levels, the Blues King offers a rich palette of Americana tones from vintage cleans to frayed overdrive and explosive fuzz. When you factor its price into the equation, the Blues King is the no-brainer purchase of 2019 so far. Expensive-sounding tones in a cool, compact and affordable package.